San Francisco composer + bassist Lisa Mezzacappa presents Glorious Ravage, an immersive evening-length song cycle for a large ensemble of California improvisers with films commissioned from Bay Area experimental filmmakers. Glorious Ravage features original compositions by Mezzacappa, and takes as its inspiration the writings of female adventurers near the turn of the 20th century, who trekked to the wildest parts of the earth to discover, escape, and lose themselves. Glorious Ravage is the product of extensive collaboration between Mezzacappa and four moving image artists—Konrad Steiner, Alfonso Alvarez, Kathleen Quillian, and Janis Crystal Lipzin—all significant figures in the Bay Area experimental film and video community for decades, working in video, animation and manipulated found and archival film footage. The virtuosic ensemble features fourteen instrumentalists plus vocalist Fay Victor. Glorious Ravage is a song cycle for improvisers, with lyrics drawn from the travelogues, journals and letters of Victorian-era adventurers Mary Kingsley, Ida Pfeiffer, Isabelle Eberhardt, Louise Arner Boyd, Isabella Bird, Marianne North, and Annie Peck, among others. Mezzacappa distills the most resonant themes of these evocative, personal texts from reading dozens of these women’s accounts, and explores their feelings of isolation and alienation, their restlessness, their unflagging ambition, their almost obsessive quests for new experiences, and their wonder at the natural world and its inhabitants. 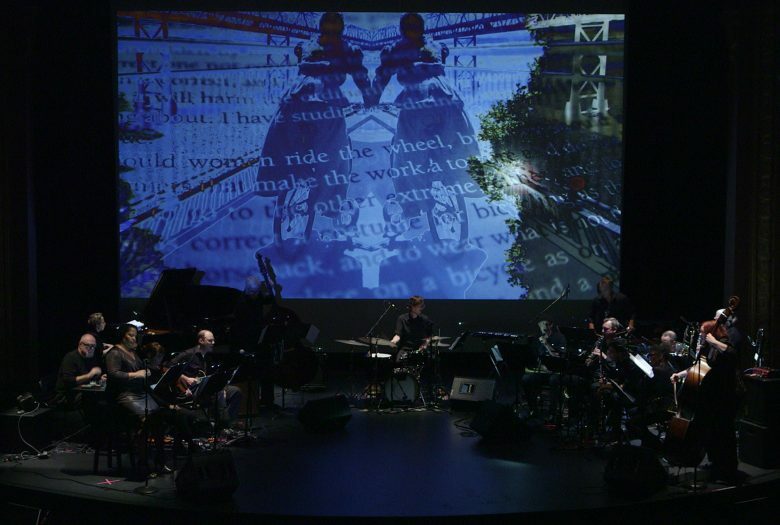 The music for Glorious Ravage conjures these passions and reflections into a work of the present moment, showcasing the virtuoso improvisers in the ensemble, their individual voices woven into a collective fabric that embraces many genres and sounds, from delicate chamber art song to expansive abstract soundscapes, groovy and propulsive jazz and edgy indie rock to intricate contemporary classical music. The music unfolds as a series of ten songs featuring Victor and various permutations of the ensemble, from intimate solos and duos to expansive orchestrations featuring the entire ensemble. Lisa Mezzacappa is a San Francisco Bay Area composer, bassist, bandleader and producer. Called “one of the most imaginative figures on the Bay Area creative jazz scene” by the San Jose Mercury News and “a Bay Area treasure” by KQED National Public Radio, she has been an active part of California’s vibrant experimental music community for more than 15 years. Mezzacappa’s activities as a composer and bandleader include ethereal chamber music, electro-acoustic works, avant-garde jazz, music for groups from duo to large ensemble, and collaborations with film, dance, sculpture and installation art. Recent projects include works inspired by noir crime fiction; scientific processes on micro and cosmic scales; Victorian lady adventurers; and vintage Italian science fiction comics. She has released her music on the New World, Clean Feed, NoBusiness, Leo, and NotTwo record labels, and has received support or her work from the MAP Fund, the Foundation for Contemporary Arts, and the Aaron Copland Fund. Glorious Ravage was created with support from the MAP Fund, the Zellerbach Family Foundation and Headlands Center for the Arts‘ Alumni New Works program. The recording on New World Records received support from the Wattis Foundation, the Aaron Copland Fund and the San Francisco Friends of Chamber Music. The Roulette performance is supported in part by Graham Connah.